Talk about a clean up! If only I could say that I'm a very conscientious clean freak and spend a lot of my time cleaning therefore today only required a cursory glance and a little dusting before the visitors' arrival tomorrow...HA chooking HA! Not so, not so. I am the antithesis of a clean freak...ok I might be in between the two cos I'm not wallowing in slobville but the accumulated dust was almost leaving footprints! 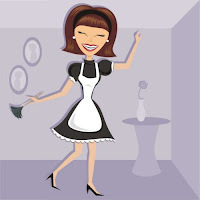 And, the very amusing thing is that in all the time I have lived here, my MIL has never (yes, NEVER) cleaned anything..except to sweep occasionally and wash a dish here and there, and today she was cleaning! I have had visitors before several times and never has she had the compulsion to clean....what be different this occasion I ask myself? It's the baby...it's got to be the todly toddler's arrival. I think she's actually freaking out about it! I might enjoy this visit even more than anticipated (mmhahahaharr)! I have to be honest and say that I am incredibly lucky and my MIL is lovely (She even sent me a wee package this week with a letter which made me grin like a mad thing). My Mum and I are going to go to Chiang Mai whilst she's here (I'm not a big beach fan) - It's a pity your not coming to BK cause I would love to meet you (in the flesh).....mind you....we might make it to your neck of the woods some time!! When your done can you come to my house and clean? I hate cleaning house. Please post pics of your friends. Tracy - No can do...I'm all cleaned out! Will do re pics!